Produced primarily in the Philippines, lakatan bananas, also spelled lacatan, are characterized by their aroma and sweet, firm texture when ripe. Typically more expensive than other bananas, lakatans rank as some of the highest quality banana cultivars, often preferred for desserts, as opposed to the common cavendish or latundan varieties. Grown year-round in the Philippines, the economically important Lakatan, as well as latundan and saba, banana varieties generally thrive as part of intercropping -- the practice of planting two or more species of plants together to yield more from the land -- and require less overall care and management. The demand for lakatan bananas in the Filipino markets outweighs the supply, which leads to higher costs for transport, explains the Small to Medium Enterprise Region 12 website. Physical characteristics of lakatan bananas include a light orange-yellow appearance when fully ripe. 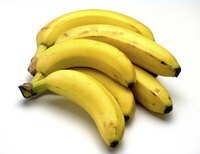 The ripened fruits also become highly aromatic and firm in texture with pulp that's sweeter than most banana varieties. As an export with a shorter lifespan than other varieties, some physical markings may appear on the peel, but shouldn't affect the flavor or quality. While the cavendish banana tops the list of the most popular variety sold in the United States, lakatan bananas work better for buffet spreads and dishes. Unlike other varieties or plantains, lakatans are meant to be consumed raw, to retain the fruit's natural flavors, explain Jules Janick and Robert E. Paull in "The Encyclopedia of Fruit & Nuts."